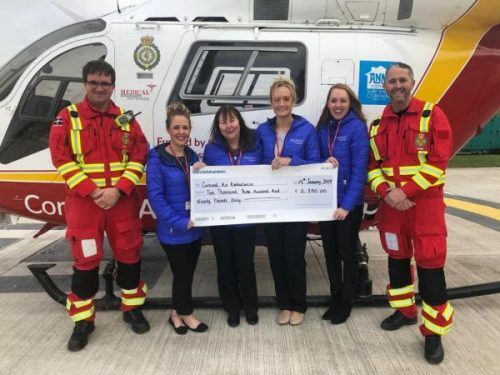 Local company Harbour Holidays has raised funds towards a charitable appeal to purchase an advanced helicopter for the Cornwall Air Ambulance flying medical service in the South West of the United Kingdom. Cornish holiday company Harbour Holidays is backing a Cornwall Air Ambulance appeal to raise money for a new helicopter for its airborne medical service. The Padstow-based company has pledged its support for the campaign to acquire a new, advanced helicopter for Cornwall Air Ambulance by April 2020. Harbour Holidays’ founder Jackie Stanley was last year appointed a member of the New Heli Appeal and kicked off the fundraising with a £5,000 donation. Since then Harbour Holidays have been supporting this cause and have raised a further donation of £2,390 which they recently presented to the Air Ambulance crew. So far the appeal has raised over £400,000 in donations from local businesses and individuals keen to support this worthy organisation, which saves lives and treats thousands of patients in medical emergencies each year. The New Heli Appeal aims to raise £2.5m to buy an AW169 helicopter to help save more time and more lives. The faster, more powerful, medically advanced aircraft will enable the Cornwall Air Ambulance crew to provide an hospital emergency room standard of care for patients wherever they are. The new helicopter will essentially provide an ‘A&E’ for the skies, with more lifesaving equipment to increase the chance of patient survival. It will also have double the fuel range of the current aircraft allowing crews to travel to emergencies back-to-back without the need to stop and refuel. As a major holiday company in Cornwall, Harbour Holidays welcomes thousands of visitors to the county each year to stay in its self-catering houses, cottages and apartments in and around Padstow. Nicky Stanley added: “I am proud to do what I can to support a charity that anyone of us could need at any time, which offers such a vital service to our community.